Introducing the easiest, most budget-friendly way to select, spec, bid and procure the furniture for your new, renovated, or expanding school. Overseeing the construction of a new school can be very challenging. There are hundreds of details, and all of them have to be handled correctly, on time and on budget. Clearly, this is one time when learning by trial and error is simply not an option you can afford. We think you could use a little help — and we are ready to provide it. Over the past 36 years, Hertz Furniture Systems has become one of America’s most trusted school furniture suppliers. Thousands of schools nationwide continue to rely on us for our unsurpassed selection, value, and service — but now we’re taking that service to a whole new level! Our new layouts for learning program gives you direct and ongoing access to our Consulting and Design Team, a dedicated group of furniture and interior design experts that will assist your furniture selection process every step of the way — on-site and off! Leading this team will be your primary contact, the Project Coordinator. You will not only have this person’s cell phone number for as-needed access — you will also have his/her full-service commitment to maximizing your purchasing power — and your peace of mind! 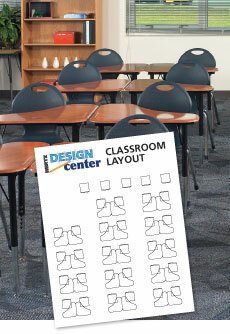 Layouts for Learning will provide you with your own binder containing detailed CAD layouts for each room with photos and specs, a list of furniture needed for each room with cost estimates, as well as fabric swatches, color samples and chips. You are assigned your very own Hertz project coordinator from start to finish! The Hertz Value Advantage — truly in a class by itself! There is no additional cost for utilizing our Layouts for Learning program — in fact, you run the considerable risk of spending much more on school furniture if you don’t take advantage of it. There are many ways to be “creative” within your budget, whether you’re equipping a classroom, an administrative office, a lunchroom, a locker room, a computer center, or a lab — and nobody is more qualified to advise you in all of these areas than Hertz — or to help you save! We not only select the “best in class” from over 250 quality manufacturers, we also have the volume purchasing power to negotiate the very best deals — and we are more than happy to pass the savings along to you, our highly valued customer. In a nutshell, we manage the project and implementation, while you approve the product selection and the final bid. Furniture Requirements We will review your architectural drawings and provide detailed room-by-room recommended furniture requisition lists. The layouts for learning interior designer will review the furniture lists to ensure that color coordination, layout and functionality has been taken into consideration. This is one aspect where the school cannot afford a mistake. Budget Assessment After we have identified your needs, we will meet with you and design each room within the budget requirements. We are very diligent in making sure that the furniture we recommend will fit within your budget parameters. We will prepare a custom binder featuring detailed CAD layouts of each room, photos, specs and cost estimates for the specified furniture, list of furniture by room and color chips. Bid Preparation We will ensure that your bids are clearly and accurately specified; that your district’s interests are effectively safeguarded (i.e. bid bonds, installation, etc. ); and that you receive the best possible volume discounts together with Hertz-class service and reliability. Bid Reporting and Evaluation After all bids have been received and opened, we will provide you with a summary of all bids that were submitted. This summary will include a comparison with group bids, total package bids and a complete line item analysis of responsible bids. Proactive Project Implementation We will make sure that this part of your building, remodeling, or expansion project proceeds smoothly and on schedule. We’ll stay in close contact with all the manufacturers to ensure that the job is completed to your full satisfaction. Unique installations? Freight issues? Inventory verification? Project coordination? Your all-star layouts for learning team does it all — and if we’re doing OUR job right, you’ll have at least two dozen fewer things to worry about!